On 25th January, the government published its annual rough sleeper count, and confirmed what is already apparent to anybody who spends time on the streets of towns and cities in England: homelessness in its most visible form has increased substantially in recent years. Beyond the headline-grabbing rough sleeping figures, what do the numbers really tell us about what is happening with homelessness in England, and how can government achieve its aim of eliminating rough sleeping by 2027? Just how many people are sleeping rough? The government’s January 2018 figures estimate that the number of rough sleepers in England on one night in the autumn of 2017 was 4,751, up by 15% from the previous year, and the seventh consecutive year in which it has increased. Rough sleeping has now risen by 169% since 2010, and can be found not just in its traditional urban centres but in a range of new locations across the country. This increase has occurred despite a government target to cut rough sleeping by half by 2022, and end it altogether by 2027. These estimates really only give us a glimpse of what is actually happening with street homelessness. The Ministry of Housing, Communities & Local Government itself describes the figures as estimates; they are a “single night snapshot of rough sleeping that is taken annually in England using street counts and intelligence driven estimates.” So, the real number is much higher. An alternative source of information on rough sleepers is the Combined Homelessness and Information Network (CHAIN), a multi-agency database recording information about people seen rough sleeping by outreach teams in London. According to this, more than 8,000 rough sleepers were seen by outreach workers in London, alone, in 2016-17. The homelessness charity Crisis estimates that as many as 9,100 people are currently sleeping rough in England. So, although important, it is best to use the government’s rough sleeping figures as an indication of a trend. And, of course, as confirmation of what is extremely visible and notable. The number of people rough sleeping is increasing: In 2016-17 the number of rough sleepers rose by 15% – which is almost identical to the 16% increase that occurred the previous year. There was a substantial increase in rough sleepers in London and certain boroughs are now experiencing significant pressure. In London the number of rough sleepers increased by 18% in 2016-17 – this contrasts with just 3% the year before. The government estimates that there are now more than 1,100 rough sleepers in the capital. The number of rough sleepers doubled or nearly doubled in several boroughs both in inner and outer London: Camden, Ealing, Islington and Lambeth, with Newham and Tower Hamlets not far behind. Camden recorded the largest increase in 2016-17, from 17 to 127. Rough sleeping is not just a London problem, and it isn’t only happening in towns and cities you would expect to see it. More than 3,600 rough sleepers in the government’s estimate were outside of London. 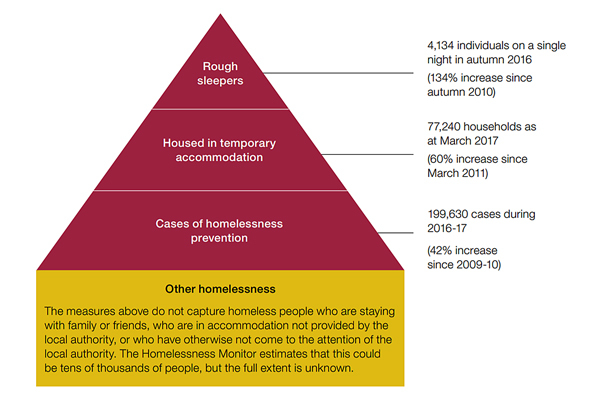 Other traditional centres of rough sleeping generally recorded high rough sleeping populations, including Manchester and Bristol (which, respectively, recorded 94 and 86 rough sleepers in 2016-17). However, almost half of the increase in rough sleepers occurred in eight local authorities: Brighton and Hove, Medway, Southend-on-Sea, Oxford, Tameside, Worthing, Salford and Eastbourne. With the exception of Brighton and Hove, these are not areas historically associated with entrenched rough sleeping. Yet, between them, in 2016-17 they hosted nearly 350 rough sleepers. Most rough sleepers are male and UK nationals. In 2016-17 86% of rough sleepers were male and, across England as a whole, around 80% of rough sleepers were UK nationals. In London, however, just 40% were UK nationals, and almost 30% from EU member states. There is a high prevalence of mental illness and alcohol and drug dependency among rough sleepers. Of the 70% of rough sleepers who had a support needs assessment recorded, 47% had mental health support needs, 44% had alcohol support needs and 35% had drug support needs. In short, the growth seen since 2010 in the number of rough sleepers shows no sign of halting, and rough sleepers are now to be found in many towns and cities not previously associated with rough sleeping. Despite the rise of homelessness, for many years the government’s approach to tackling this challenge was deliberately light touch, which is difficult to understand when faced with such a visibly growing problem. The government is now taking a stronger approach to tackling all forms of homelessness, as shown in our recent report, Homelessness. 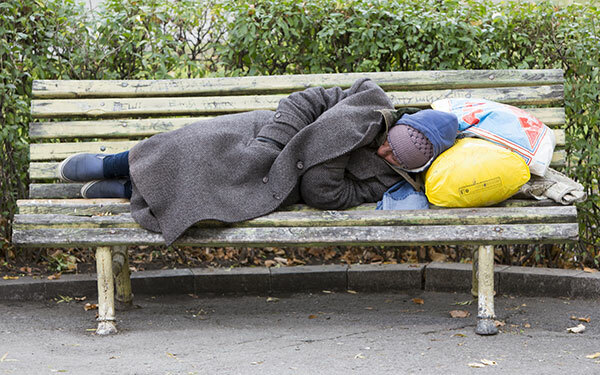 It is seeking to improve the data it holds on homeless people, and is implementing the Homelessness Reduction Act, which will increase the prevention role played by councils. It has also established a cross-government homelessness task force. All of these measures will be needed if government is to achieve its target of halving rough sleeping by 2022, and abolishing it altogether by 2027. We would welcome your comments and invite you to contact us if you would like to discuss any issues raised by this blog. A further article by Matthew Wilkins on homelessness and what councils are doing to address it will be published later in February as part of the ‘State of the Public Sector, 2018’ report, which will be available for download from the Public Sector Show’s website (scroll to bottom of the home page). You can also explore the scale of homelessness across the country in our interactive data visualisation. 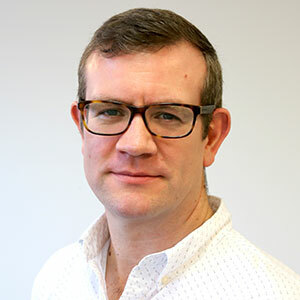 About the author: Matthew Wilkins works on our team producing value for money reports on local government and the Ministry for Housing and Local Government. He manages a portfolio of studies on topics including housing and English devolution, and was the lead author of the NAO’s September 2017 report on homelessness. He has also previously written reports on a range of subjects including local economic growth, border security, violent crime, and stroke care. Quite a frightening summary. It would be interesting to know the main reason stated by rough sleepers for their situation, as well as an age profile, and social background. The problem with government is that it appears to have no memory and no understanding of the consequence of decisions taken by this and the previous coalition government. In the 1990s rough sleeping had risen to very high levels and a 1998 appeal court ruling judged that housing benefit could be used to cover only the ‘bricks & mortar’ not the additional support that it had been used for. This led directly to the introduction of the Supporting People Programme which cost £1.8 billion in its first year. This programme provided funding for housing support for all the groups of people wo are now sleeping rough on the streets. A 2009 study showed the “best overall estimate of net financial benefits from the Supporting People programme is £3.41bn per annum for the client groups considered (against an overall investment of £1.61bn) by saving on other health & social care costs. Reductions in the SP budget from 2010 followed by the removal of the ring-fence around this budget in 2012 is one of the major causes of the problems we have now, exacerbated by other issues such as reduction in public funding for social housing and changed to housing benefit rules. These latter have once more been threatening the financial viability of sheltered housing scheme for older people and Refuges for people (mainly women) fleeing domestic violence – which is exactly where we were in 1999. The town planning tool “community profile and projection” was developed in 1970s England by Barry Cullingworth of Preston and Colin Cuthbert of Carlisle. It is the principal criterion for housing construction and public facilities finance from central sources in Germany and some Australian States. Until it is used similarly here we remain stuck in the present mess with ever greater numbers sleeping rough. Numbers are greater now than when my Gran did her research in 1905. Professor Rod Rhodes knows a bit about this. He followed Cullingworth to Australia, becoming the local government guru. We need to recreate a situation where a permanent Clerk of Works records all daily deliveries and events on housing construction sites with only accredited skilled personnel permitted to work – just like in New York City. People here have become used to 50% of the price of a new house or flat being sheer profit. That is nowhere near sustainable if the undersupply problem is to be beaten. This is indeed very worrying. Looking beyond the numbers, I would like to know a little more about the reasons why people become rough sleepers (obvious reasons would seem to include unemployment, family breakdown and the drug/alcohol dependency issues highlighted here) and whether there is any truth that some are unwilling to go into temporary hostels. If there is no truth in this, surely the government could solve it at one stroke by setting up more temporary hostels. We need to have more detail before we can understand what actions we should be pressing our political leaders to take. We have thousands of empty properties in the UK. Many abandoned for years. Surely we can get the homeless to work for a bed. If we can get people who are homeless to paint repair clean abandoned properties repossessed by the government. Charities can help furnish the properties. Homeless people can learn new valuable skills, joinery plumbing painting tilers roofers gardeners friendships can be made and then the homeless are able to regain their lives back and work. You don’t actually answer your own question. Instead you’ve provided some statistics and demographics and, in so providing the latter, infer that it’s something to do with the make up of the groups you describe and potentially therefore, that it’s their fault. This is dangerous and absolves communities (who are stretched anyway) and the Government of responsibility. An imprecise piece of writing despite the statistics, particularly as you dismiss CHAIN so readily. You’d have perhaps been better simply to call it ‘Some numbers about rough sleeping’. Thanks for your comment, Hannah. I would like to reassure you that I do not disregard CHAIN figures at all. My point was very much that as we look at the official figures in detail, it is important to remember that the government recognises that they are only estimates, and that other estimates are considerably larger. Regarding the analysis of the figures, this is certainly not to attach any blame to individuals. Rather, by understanding the make-up of the individuals, policy-makers can improve their understanding of the possible causes and therefore effective solutions. Finally, you are right that we don’t fully answer to the question posed in the title of my blog-post. For a fuller answer I would direct you to our report, Homelessness, which sets out in detail the apparent drivers of the increase in all forms of homelessness. Are there any more recent figures regarding rough sleeping in London in particular. I volunteer at a Soup Kitchen and we are putting together an exhibition for next year to help raise awareness. It would be advantageous to have update information. At the kitchen we have noticed since the summer, in particular, that the numbers are growing and on some days we are feeding over 100 people.